It was lift-off thirty-two years ago today when DAVID BOWIE first released his most famous worldwide million selling smash hit 'SPACE ODDITY' on the Philips and Mercury record labels. Originally released in mono sound and then followed by a stereo version, the song is frequently mistakenly titled "Ground Control To Major Tom" to your average man on the street. Strangely, the song holds probably one of the most unique and quirky music trivia facts of all time... in total the single release of 'Space Oddity' took 6 years and 63 days to eventually reach the No. 1 spot! First released on the Philips label in Europe (BF1801) and Mercury in the US, it wasn't until it was re-released by RCA Records (RCA 2593) that it eventually hit the top spot in the UK and USA. RCA as part of their Maximillion Series, re-released the track backed with 'Changes' and the previously unissued 'Velvet Goldmine' on 26th September 1975. In the UK it took only a month to reach the number one spot where it remained for an unstoppable three weeks. Velvet Goldmine was released without David's consent and mixed by person or persons unknown, much to David's disapproval. The musicians of the original release were: David Bowie (vocals, 12 string acoustic guitar, Stylophone), Herbie Flowers (bass), Terry Cox (drums), Mick Wayne (electric guitar) and Rick Wakeman (keyboards). David also recorded a version in Italian titled 'Ragazzo Solo, Ragazza Solo', which literally means 'Lonely Boy, Lonely Girl' on the Philips label (BW704 208). In February 1980, RCA also released an alternative acoustic version appearing on the B-side of 'Alabama Song' (RCA BOW5). The album Scary Monsters (And Super Creeps) was recorded in two periods, February 1979 in New York and finished in April/May 1979 in London, with the acoustic version of Space Oddity first publicly aired on The Kenny Everett 'New Year' Show on 31st December 1979. 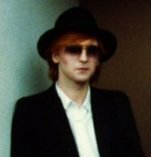 The video footage, showing David in the now familiar surroundings of the yet-to-be released 'Ashes To Ashes' promo video. Tony Visconti said last year: "The acoustic version of 'Space Oddity' was recorded for the Kenny Everett show later in 1979, and was never meant to be a single. Andy Duncan is on drums and a Bowie look-a-like, Zaine Griff, is on bass. I temporarily forget the pianist. David, again, played 12 string. "Another little known fact is that David never owned his 12 string that he played on 'Space Oddity' and 'The Man Who Sold The World'. It was borrowed from a friend. He now owns his own 12 string." The single contained the immortal groove out words "Sorry Gus" scratched in by producer Tony Visconti as a tribute to the original producer Gus Dudgeon.